A traditional real estate development (left) constrasted with a hypothetical conservation development (right). Conservation developments are a broad range of approaches to integrating conservation objectives into traditional real estate developments. Conservation developments target the design, construction, and stewardship of new developments and aim to keep a significant portion of the land in a natural state, while strategically clustering development on a smaller portion of the property. Conservation developments can take diverse forms at scales ranging from a small area with a handful of buildings on a single property, to conservation subdivisions, to entire communities. This tool has been applied widely since the 1990s, and there is increasing evidence that well-designed projects can achieve measureable benefits for people and nature. In Grayslake, Illinois, the concept of maximizing conservation within residential development was put to the test in the construction of the Praire Crossing subdivision. In the late 1970s, the land that Prairie Crossing stands on was slated for conversion into 1,600 housing units on 675 acres. However, neighbors of the property had long held a deep love for the natural prairie in their backyard. When the property was acquired by George and Vicky Ranney, they envisioned building a community that prioritized conservation and the preservation of the Midwestern landscape. Their plans contained just 359 houses and a condominium in place of the originally planned 1,600 housing units. The master plan for Prairie Crossing also included a trail system, a 100-acre organic farm, a charter school, and two metro train stations. As the subdivision was constructed, great care was taken to integrate as much of the native prairie landscape as possible. Growth of native plans helped Prairie Crossing developers meeting one of their goals: using native vegetation to mitigate flood and stormwater risks and act as a natural filgration system to maintain high water quality in the development's lake. By restoring native plans to the landscape, Prairie Crossing has also been successful in sustaining high-quality of wildlife habitat; residents have observed up to 188 species of birds and mammals such as least weasel and mink. The development has also seen financial successes, with homes selling for 20 to 30 percent more than comparable homes in the area. By applying conservation principles, the Prairie Crossing subdivision has become a leading example for how to integrate natural amenities and agricultural uses with traditional residential development. "By restoring native plants to the landscape, Prairie Crossing has also been successful in sustaining high-quality wildlife habitat; residents have observed up to 188 species of birds and mammals." 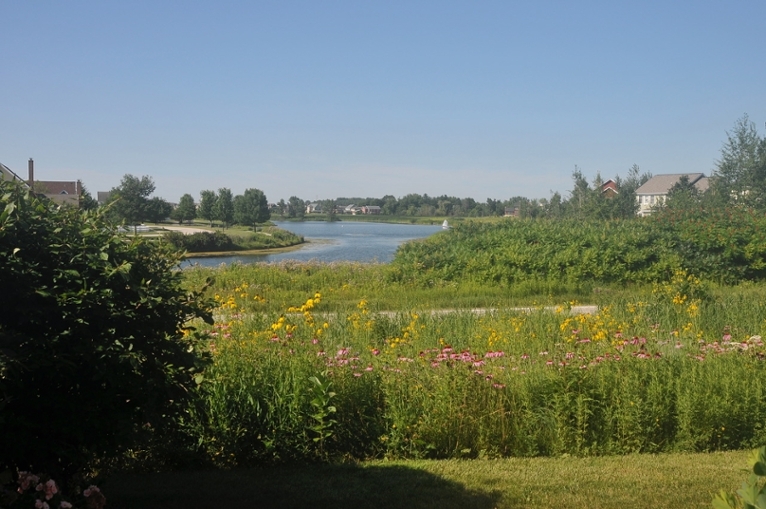 Native plants and flowers interspersed throughout the Prairie Crossing development. Photo: Liberty Prairie Foundation. Pejchar et al. (2007). Evaluating the potential for conservation development: Biophysical, economic, and institutional perspectives. Conservation Biology, 21(1), 69—78.